Finite Element Analysis is essentially the process of breaking a model into very small shapes so that a computer can do a ton of math on it to simulate physics. This tutorial will go through the process of doing a stress analysis on a landing foot used on Spinny. 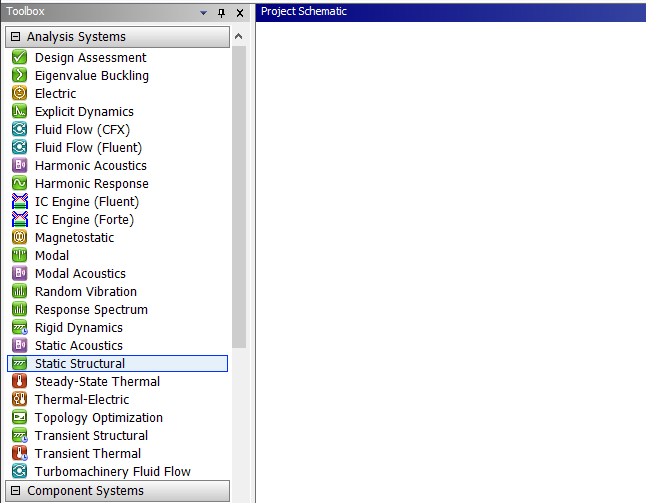 Begin by launching ANSYS Workbench and insert a Static Structural analysis system into the project. Pre-processing is the stage where you add essentially gather all the ingredients that you need to run the FEA. This includes the materials and meshed geometry. To add any new material to your project, open up Engineering Data and click on Engineering Data Sources which is accessable through both the Right Mouse Button and a tab near the upper left corner. 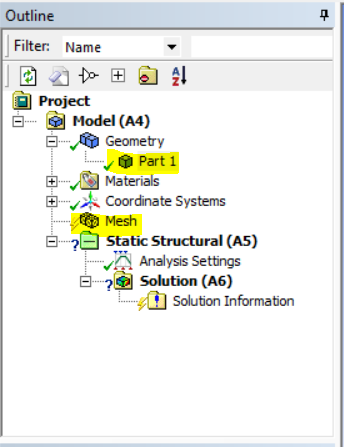 The default placeholder material that ANSYS uses is structural steel. 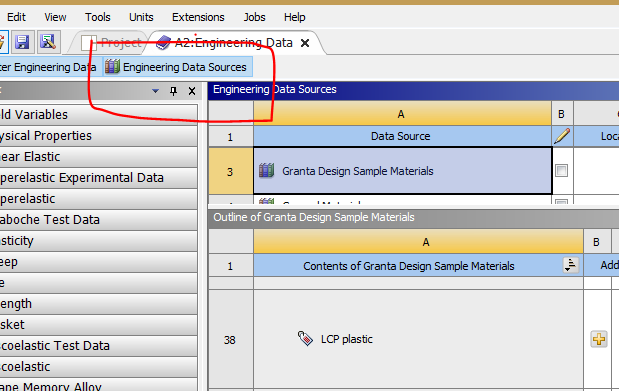 Add ABS plastic (located under Granta Design Sample Materials) to your project by clicking on the plus sign. This section is where the raw 3D model gets subdivided into its elements in a process called meshing and is alo where material assignments take place. After opening the model in ANSYS Mechanical, you will see an outline on the left side. Expand Geometry until you reach the part you inserted and change the material to ABS Plastic in the details window right below. Next, generate a mesh using the default settings. A finer mesh can result in a more accurate model, but it will take more time for the computer to solve, likewies, a coarser mesh will be quicker to use but less accurate. The solution section is basically where you can take a break and let the computer do all the heavy work after you do some initial setup. This part encompasses the actual simulation of your model. Note that you do not need to exit the Mechanical Window to access setup, it is accessable from the outline window once you click the name of the analysis, in this case, "Static Structural." Once you click on that or any of its subfolders, you may notice that the ribbon directly above the outline window has changed. 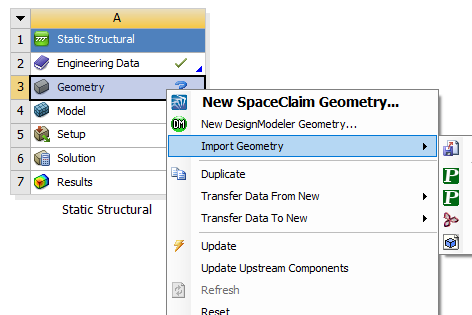 Make sure that you are either on "Static Structural" or "Analysis Settings," and now you can start to add boundary conditions. There are types of boundary condition including inertial (gravity, acceleration, rotational velocity, etc) which deal with the movement of the body, loads (force, pressure, temperature, radiation, voltage, etc) which usually inolve an external entity acting upon the body, supports (fixed support, cylindrical support, fixed rotation, etc.) which fixes a property of the body, and a few more. Note that not all boundary conditions are applicable to each analysis system, for example, we cannot add a voltage to our static structural analysis. For this part, add fixed supports to the part of the feet that touch the ground (Ctrl click to select multiple faces). If you are not selecting faces, but instead keep selecting individual lines or the whole body, change the selection mode on one of the top ribbons (lots of mouse pointers and cubes) to face. 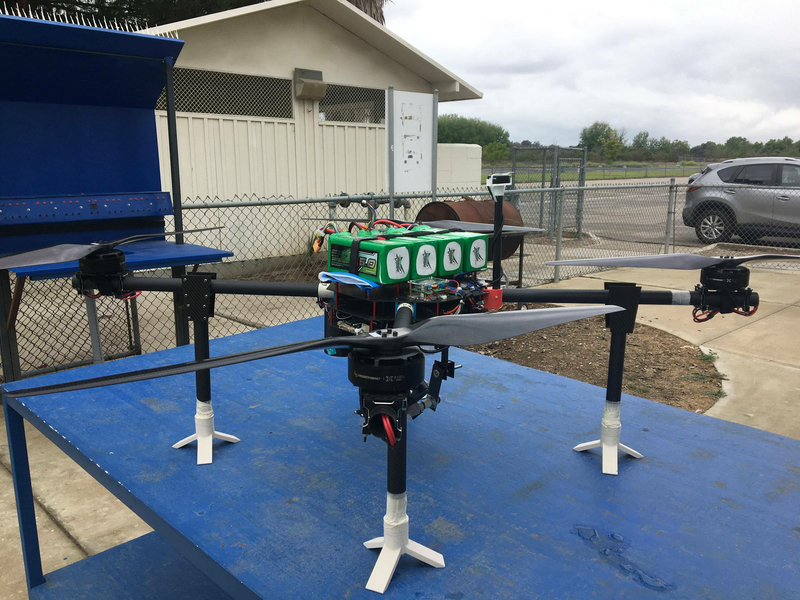 Next, add a Force to the face of the inside of the cylinder where the drone would come in contact with the foot pad. Make it around 33 Newtons or 7.5 lbf. Make sure the the direction of the force points downwards, which should be the -Y direction. Note that under Analysis Settings, you can change the duration of the simulation. In this section, you can add contour plots to better visualize your model. You can choose from a large array of results to plot. The most popular are Total Deformation and Equivalent Stress. Add both of these and Solve the model. This stage of FEA is essentially checking over your results to see if they make sense. After your computer has finished solving, you can click on the individual contour plots in the outline to look at them. You can also customize the display to show less/more colors, add min/max indicators, show the undeformed wire frame, etc. Additionally you can play an animation of your solution. Now that you are finished with the tutorial, feel free to play around; change the values of the forces, add/change boundary conditions, and maybe even go back further to add new geometry. Create your own ANSYS simulation using any system and geometry that you want.